Bournemouth & Poole College has secured its third award at a national contest held as part of the prestigious British Marine Electrical and Electronics Association Apprentice Awards. 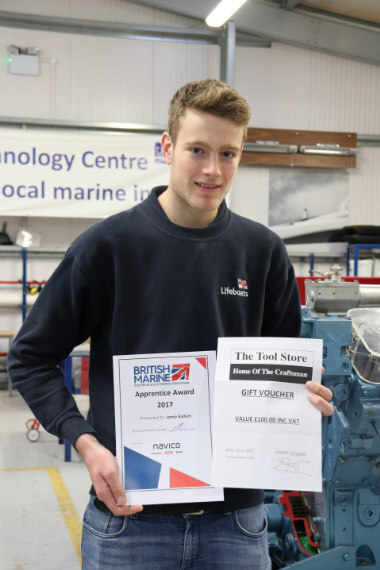 Two apprentices at RNLI, Jamie Ballam and Harry Butterfield, saw off tough competition from seven other teams to win a national contest held as part of the British Marine Electrical and Electronics Association Apprentice Awards. They impressed judges with their design and production of a circuit to raise and lower a swim platform using digital switching and timers. The challenge had to be completed in two hours. Organised by the British Marine Electrical and Electronics Association (BMEEA), the competition is designed to recognise the very best of young British talent in the Marine Electrical sector. Harry Butterfield added, “As part of the competition we also attended the annual BMEEA conference. It was a great insight into the rapidly advancing technology that is being used in the marine industry. The awards began in 2014 and since then a team from the College has secured the top prize every year. In 2014 George Wooliss and Alex Spencer from Sunseeker International won with their efforts and in 2015 Will Hicks and Ashley Cobb also from Sunseeker International impressed with a motor switching, latching and stopping challenge. Please visit www.thecollege.co.uk/online-on-campus for more information.